I thought a bit before I wrote that headline. After all, tree rats (a.k.a. squirrels) are as important to the balance of the food chain as spiders—and you don’t see people running around killing them for no good reason. Oh wait. Anyway, why would the pro-animal / ant-hunter brigade be upset? Aren’t rats just as important as squirrels? Any personal doubts about the wisdom of assassinating squirrels eased as I read The Bastrop Daily Enterprise’s story Don’t put away shotguns just yet. “I called David Moreland who before his retirement was head of the game division for the LDWF. I asked Moreland why the agency decided to have a spring [squirrel] season in the first place. ‘This gives hunters an opportunity to get out in the woods during a time when no other season is open. School is letting out for the summer and what better time for dads to introduce their youngsters to the sport of hunting. 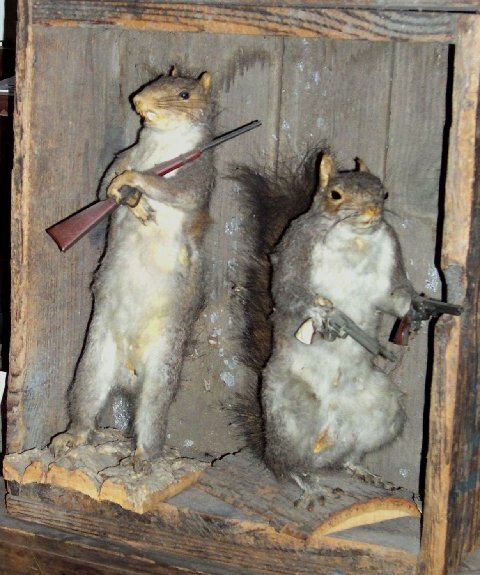 Louisiana has an abundance of squirrels so hunting them in spring will have no effect on the squirrel population,’ said Moreland.” Apparently, it’s not as easy as all that . . .
Sutton issued a warning hunters must consider when taking to the woods in springtime; snakes and mosquitoes. Another good thing about bagging a few squirrels in spring, Sutton says they’re tastier than those you collect in the fall and winter.